Update July 2017: happy to report the i360 now has a new CEO and it appears to be running in much better order. Last week I booked a flight on Brighton’s new i360 observation tower. It was the second ever public flight, so as expected had some teething issues. Our flight due to leave at 14:20 was running over an hour behind, although that wasn’t communicated at all in the queue. We were then left standing in a holding pen for 45 minutes whilst waiting to board – here there were a handful of deck chairs but no adequate seating for the elderly or those with children and no refreshments (the ticket states food or drink are not allowed through security). Once in the pod we waited a little longer to take off – a chance to buy a drink from the onboard bar. Whilst ordering their till system broke which led them to finally offer a complimentary drink for those waiting; much-needed hydration. 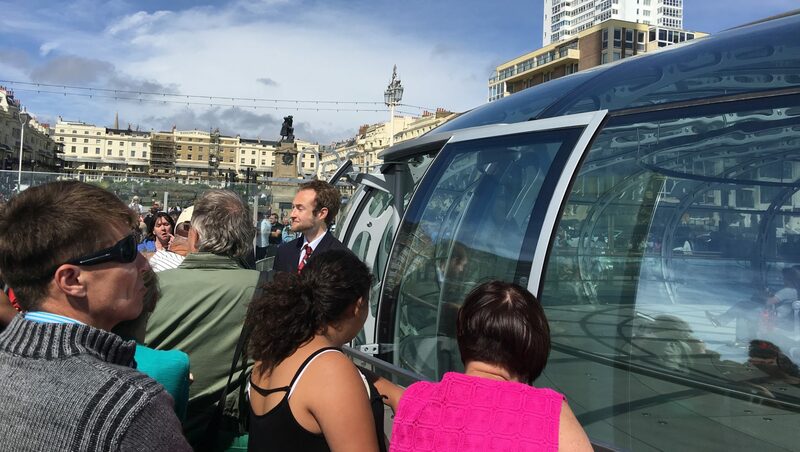 All in the experience took over 2 hours, but the i360 tweeted offering refunds or rebooking for everyone there on launch day: Great – there’s always some issues on launch day so we were tolerant of the delays and this makes up for trouble. I went into the ticket office on Saturday to get our refund so we could rebook an evening flight (which last 10 minutes longer than a day flight) later in the summer. 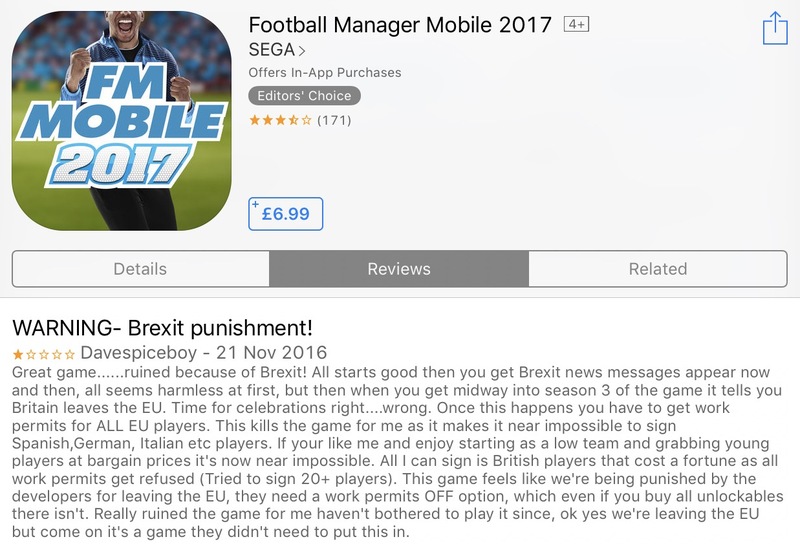 I then waited for a manager to confirm and authorise the refund. I think you’re just trying your luck. Eleanor explained to me that the tweet meant for those who couldn’t make the flight because of delays (which weren’t communicated), then said it was tweeted by a junior member of her team without authorisation. Which is it? Why was it still online three days after it was originally posted? The now-deleted tweet is in The Argus article about launch day. They told me they lost a lot of money that day and no refunds will be offered. After speaking for 5 minutes, Eleanor, the CEO, walked away from me saying: “I’m leaving now”. Promised refunds or rebookings were not offered. 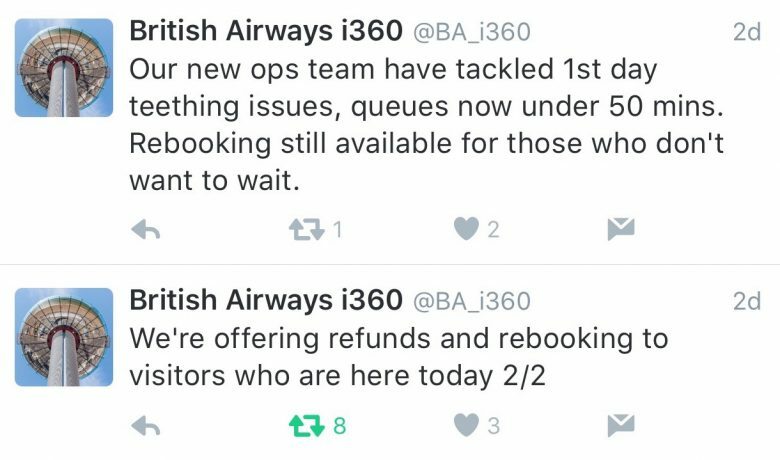 I wanted to like the i360, hence my eagerness for a launch day flight, but the customer experience has been terrible. Whilst in the ticket office there were others complaining that a private party skipped the queue whilst flights were already heavily delayed – turns out they were the architects. The promising side, the ride itself has great views and the bar stocks with drinks from local producers. With some management changes, better customer experience and scheduling the i360 will be the experience the West Pier deserves. @hiyakarl hi Karl, it stands for innovation, independence and integrity.